Without Alfred Hisch’s old tools, a piece like this would simply have been impossible to make – his esteemed old colleague Max Pippig was the last master chaser in Munich at the time. 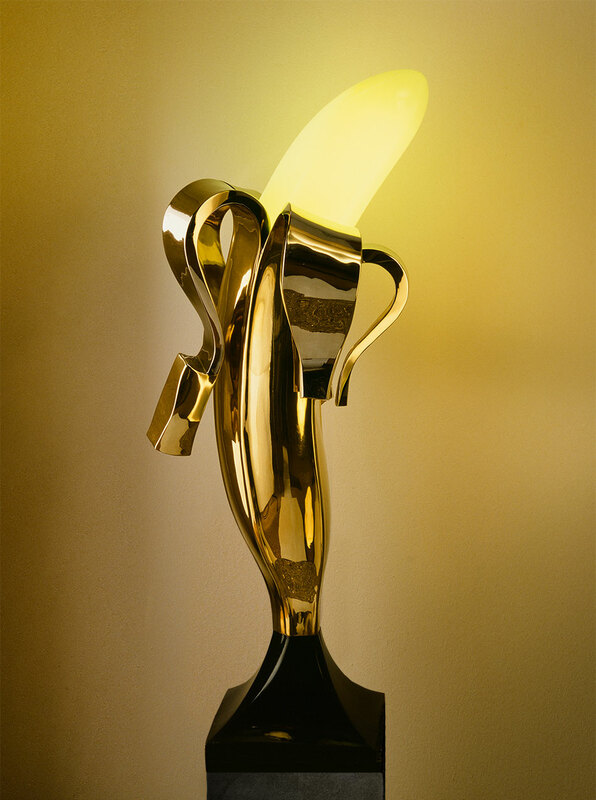 The 110 cm tall banana was made from 1.5 mm thick sheet brass. This was wrought with a hammer, soldered with silver on both sides, filed, sanded and finally polished by the brilliant polisher Hans Sandmeyer. The inside of the banana peel is nickel-plated. The base is carved from glue-laminated, black lacquered hardwood. The tools that EL Schmid used to give the banana its form dated back to when the workshop, then owned by Alfred Hirsch’s father, was used to realise the architect Albert Speer’s designs for the Reich Chancellery (Reichskanzlei). Amongst other things, the production of chandeliers was ordered. But when the chandeliers for the Reich Chancellery were ready, shortly before the end of the war, they were melted down and made into cartridge tips… Hopefully the banana will be spared such a fate!